Craper Multipurpose HTML template is based on a 1170px grid system and ready for bootstrap. Including 25 different HTML pages, you might use a a lot of fantastic features for your own website. There are 5 different homepage options, 2 about pages, 2 contact pages, 5 blog pages and 9 different portfolio page options. You can easily use all features and widgets of the template and create a complete new website. Start to design you website today! 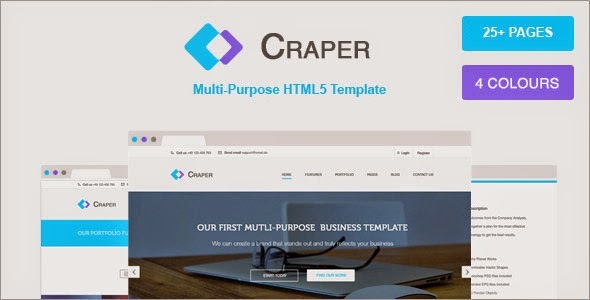 Item Reviewed: Craper Responsive Multipurpose HTML5 Template 9 out of 10 based on 10 ratings. 9 user reviews.